Rather than write up the story, I’ve chosen to reproduce an email which I sent some minutes ago to the Prime Minister (Joseph Muscat), his chief of staff (Keith Schembri), the Justice Minister (Owen Bonnici), the CEO of Malta’s sale of citizenship scheme (Jonathan Cardona) – all on their @josephmuscat.com addresses – and the group chairman of Henley & Partners (Christian Kalin). 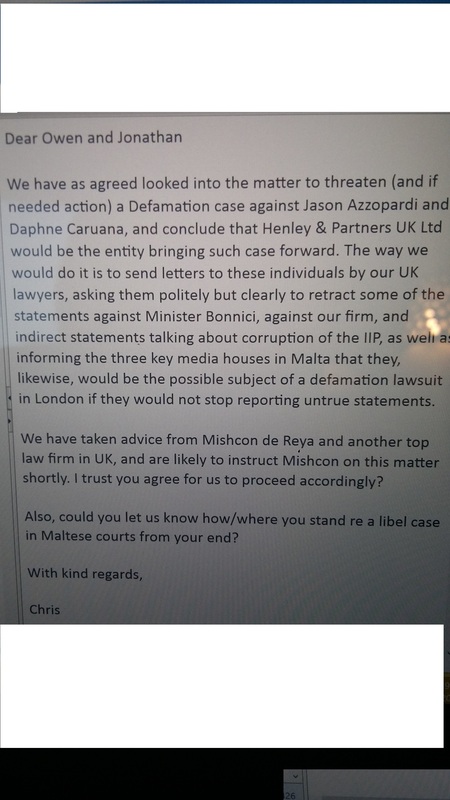 The email is copied to the two lawyers at the London law firm Mishcon de Reya, Emma Woolcott and Harry Eccles-Williams, who have been harassing me with letters and demands at the request of Henley & Partners, in turn at the request of the Prime Minister and his chief of staff, to the leader of the Opposition, and to editors at The Malta Independent, the Times of Malta, Malta Today and LovinMalta. I have in my possession evidence, in the form of email exchanges between the addressees of this message, that Henley & Partners’ threat/decision to sue me in the UK courts was taken on instruction from, and in collusion with you, the Prime Minister, Joseph Muscat, his chief of staff, Keith Schembri, and the Justice Minister, Owen Bonnici. Following a meeting on the subject with the Justice Minister, Christian Kalin, who is group chairman of Henley & Partners, outlined a plan under which letters designed to intimidate with the threat of a financially ruinous and extremely cumbersome law suit in the “UK courts” were to be sent to me, to the Opposition MP Jason Azzopardi, and to “three media houses” in an attempt at dissuading us from further scrutiny of Henley & Partners and its opaque and damaging activities in Malta. This plan was then put past you, the Justice Minister, and you, Jonathan Cardona, CEO of Malta’s Sale of Citizenship Scheme, for your approval. It was also forwarded to you, the Prime Minister and to you, Keith Schembri, in tandem, and Henley & Partners’ group chairman addresses you by your first names: “Keith, Joseph”, in that order. You, the Prime Minister, reply: “i don’t object” (sic) and you, Keith Schembri, reply: “Thanks, Chris. This looks good. Very kind regards”. At some point, you dropped the decision to threaten and intimidate the “three media houses” and Opposition MP Jason Azzopardi, with a view to focussing solely on me with a barrage of letters and emails from Mishcon de Reya, a respectable law firm with a reputation to protect, who may be unaware that they are being used as a tool to effect the corrupt plans of the Prime Minister of a European Union member state against a journalist who he has marked out as his own personal enemy, and who he wishes to ruin financially because he cannot do so in other ways. You will notice that rather than using your official @gov.mt addresses, I have chosen to use your unofficial @josephmuscat.com addresses instead, given that these are the addresses which you use for your illicit and highly unethical negotiations and correspondence with Henley & Partners and others, as seen by myself in a shocking series of emails that illustrate how far the Maltese Prime Minister and those closest to him have fallen down the road to corruption and abuse. At the most basic level, it is beyond belief that the Prime Minister of a European Union member state – as distinct from Henley & Partners’ favourite stomping-ground, St Kitts & Nevis – would allow himself to be addressed in this overly familiar fashion by the chairman of a corporation that has come to Malta to sell European Union Schengen Zone passports through a convenient arrangement with yourselves, to the detriment of other EU member states and with damaging consequences for Malta itself, or that he would allow himself to be addressed by that chairman in the same bracket as his own supposed underling and chief of staff, with his chief of staff even taking precedence: “Keith, Joseph”. 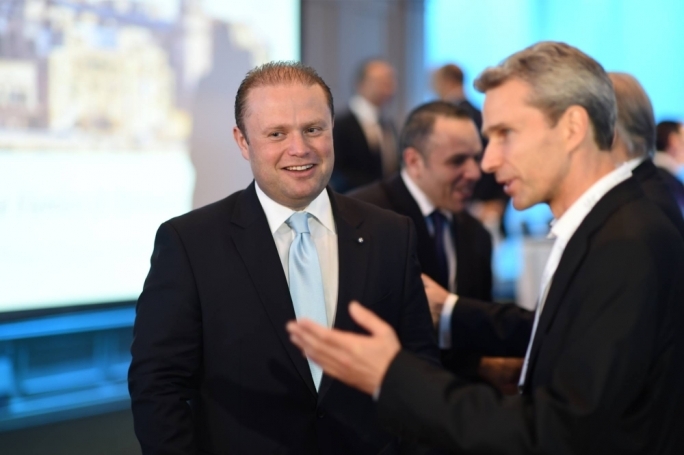 It is just as disgusting that you, the Prime Minister of my country, stoops so low as to enter into collusion with a corporation chairman, showing him that you deliberately and maliciously use an @josephmuscat.com address for ‘official’ business rather than your @gov.mt address, and that you have drawn your Justice Minister and the CEO of Malta’s Sale of Citizenship Scheme (your former ‘Sherpa’) into collusion to do likewise, along with your chief of staff Schembri who you clearly treat as a business equal if not actually a superior to whom you concede. In other words, you, the Prime Minister of Malta, have no problem at all showing a corporation chairman that you are deliberately and maliciously choosing ways and means to cheat the public you have been elected to serve, and to hide information from the civil service, and that you so lack the dignity of the office you hold, that you draw the corporation chairman with multiple passports into this plot to hoodwink your own government and people. I know that this email will be ignored by you, the Prime Minister, by you, his chief of staff (you have already barred my telephone number), by you, the Justice Minister and also by you, the CEO of Malta’s Sale of Citizenship Scheme (who brazenly and disgracefully uses the email address [email protected]). But I shall still ask the question as to why you are colluding with Henley & Partners using @josephmuscat.com addresses hosted on a private server in the United States, rather than your official @gov.mt addresses hosted on the Malta government’s servers. This particular question is addressed to Christian Kalin, group chairman of Henley & Partners: Why, despite the fact that you are here operating in a European Union member state and not in the Caribbean islands of St Kitts & Nevis, you have agreed to collude with the Prime Minister, his chief of staff, another senior cabinet minister and the head of Malta’s Sale of Citizenship Scheme using @josephmuscat.com addresses, when you know – because you operate extensively in corrupt and undemocratic jurisdictions – that the sole purpose of this is to keep the exchanges from being part of official government records as they should be. I should add here that, this morning at the Courts of Justice, I informed the inquiring magistrate in the Egrant Inc/Pilatus Bank inquiry that the Prime Minister, his chief of staff, the Justice Minister, the chief of Malta’s Sale of Citizenship Scheme and other key henchmen are all using [email protected] addresses for their illicit exchanges concerning Henley & Partners, which would indicate that they are doing the same in their other (nefarious) plots. I also suggested that he should act immediately to gain investigatory access to the josephmuscat.com email server as he will probably find many of the answers he is looking for there. Meanwhile, a word of advice to the addressees of this email message: if you are going to take the trouble to creep around using @josephmuscat.com addresses to hide your dealings from the public and the civil service, it’s a good idea to make sure that you don’t automatically pick up your correspondent’s @gov.mt address by default when you type in his name, as that will send the entire chain of emails to the Malta government server. 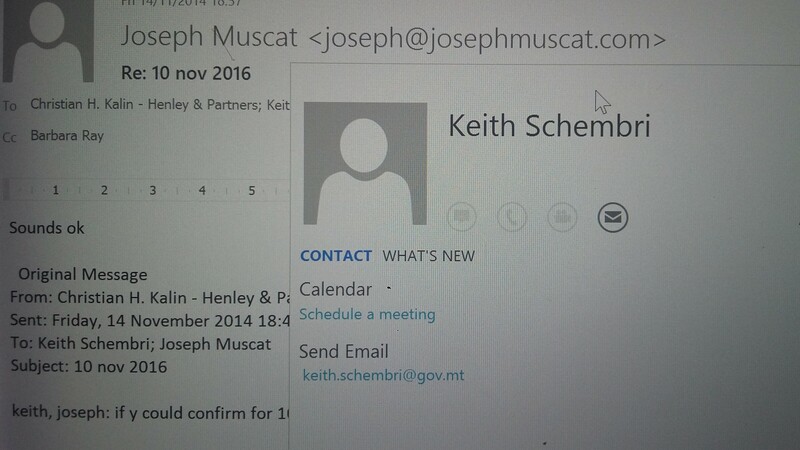 In some of the correspondence between Christian Kalin of Henley & Partners and Joseph Muscat, Keith Schembri, Jonathan Cardona, and Owen Bonnici, the ‘@gov.mt’ email address is mistakenly picked up by default instead of @josephmuscat.com, throwing whole chains of exchanges into the Malta government server.